At the end of the fall, Oklahoma State coach Josh Holliday confided that he thought his team had a chance to be very special in 2019 — but he wasn’t quite sure what to expect from his young talent in 2018. It turned out, “sooner” won the battle against “later”, as is often the case in Stillwater, where Holliday and his stellar coaching staff have a strong history of getting the most out of their talent, especially in the second half. 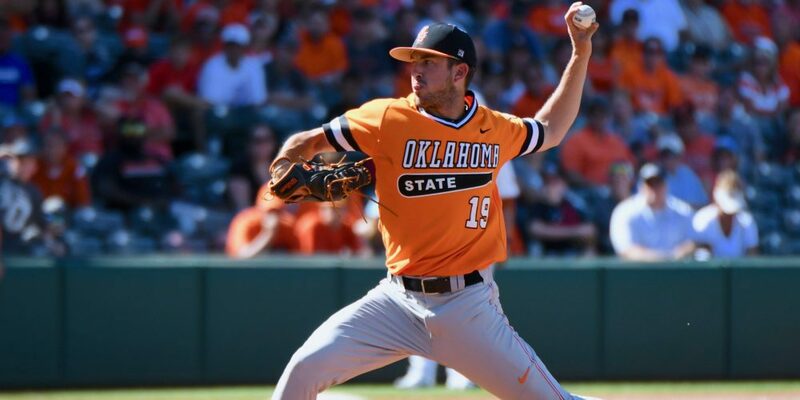 Heading into a tough nonconference road test this weekend at Iowa, Oklahoma State finds itself sitting pretty atop the Big 12 standings at 15-3, three games ahead of second-place Texas and four ahead of powerhouse Texas Tech. It took 10 weeks for the Cowboys to break into the D1Baseball Top 25, but they’ve quickly shot up to No. 17 in the latest rankings — and more importantly, we now project them to host a regional. Of course, there’s still a long way to go for that to become a reality — OSU is just 26th in the RPI, and it has three tough series left at Iowa, at Baylor and vs. Texas Tech. But still, Oklahoma State is 15-3 in the Big 12, and that’s awfully loud — especially considering how the season started.